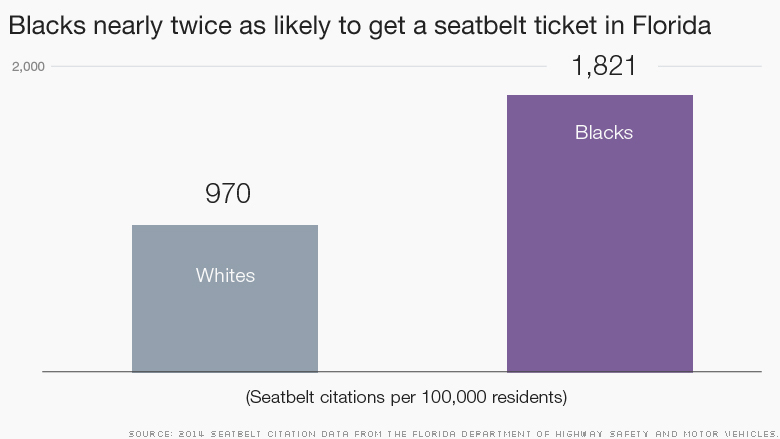 Black drivers in Florida are nearly twice as likely to be ticketed for seatbelt violations than whites, according to a new report from the American Civil Liberties Union released Wednesday. And in some counties, black drivers are getting ticketed at much higher rates. While black motorists made up 13% of the overall population of drivers in the state, they received 22% of all seatbelt citations in 2014, the ACLU found. If black drivers were given tickets in proportion to the number of drivers they represent in the state, officers would have issued 16,572 seatbelt citations to black drivers last year as opposed to 36,868. "These racial disparities raise serious concerns that officers are engaging in racial profiling when enforcing the state's safety belt law," said Nusrat Choudhury, an attorney with the ACLU and a co-author of the report. The ACLU also found that there was very little difference between blacks and whites when it came to wearing seatbelts. 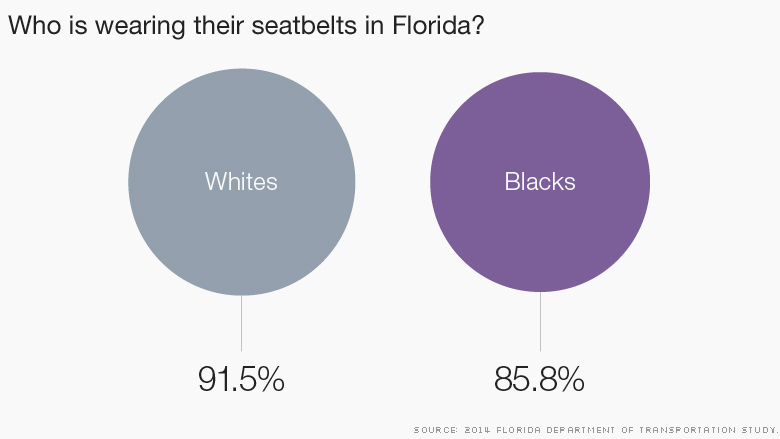 According to data from the Florida Department of Transportation that was cited in the report, authorities observed that 85.8% of blacks wore a seatbelt in 2014 compared to 91.5% of whites. That disparity cannot account for blacks being ticketed at almost twice the rate of whites, said Choudhury. "You would have to see blacks using seatbelts at about half the rate of whites to justify the disparity statewide," she said. Since 2005, law enforcement agencies in Florida have been required by law to report the race of the drivers they cite for safety belt violations. Yet, the number of agencies reporting race statistics has dropped from 293 departments to 147 in 2014, according to the Florida Department of Highway Safety and Motor Vehicles. In Palm Beach County, blacks were 3 times more likely than whites to be stopped and cited, and in Orange County, blacks were 2.8 times more likely to be ticketed than whites. 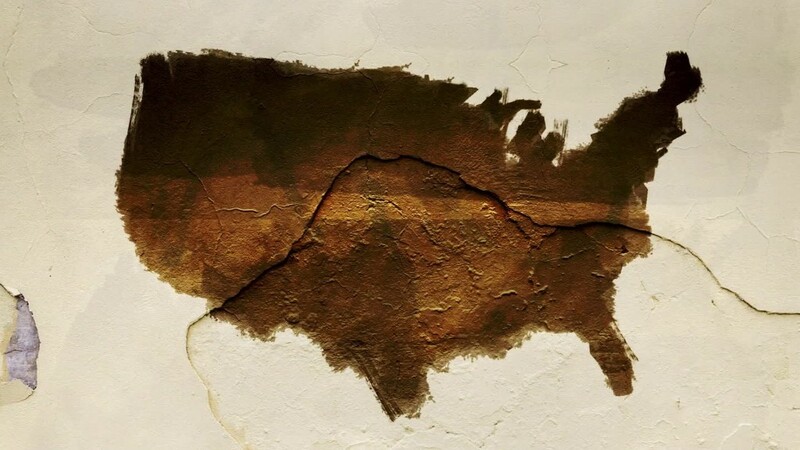 Both of these counties reported data through 2014. CNNMoney reached out to several law enforcement agencies mentioned in the report, but they did not immediately return calls seeking comment. Amber Southard, the public information officer for the Escambia County Sheriff's Office, said the department had received the report after business hours Tuesday. "We are still currently going over the data and we are working with our local chapter of the ACLU." Teri Barbera, the director of the media relations bureau of the Palm Beach County Sheriff's Office sent links to two online videos of officers promoting pedestrian safety but did not respond specifically to the ACLU findings. ACLU is calling on the Florida Legislature to create a sanction for law enforcement agencies that fail to report demographic data, which, according to the report, include those in Miami, Tampa and Jacksonville/Duval counties. The report also calls on the Florida Attorney General Office of Civil Rights to investigate the counties where racial disparities are higher than the state average.